"A culmination isn't just the conclusion, It's the climax of the story. It's the final crowning achievement, the end result of years of research. The Culmination of your wedding story is your wedding album. He got down on one knee and in the sweetest way he knew how, he asked you to marry him. You said “YES! !” and after he slipped the ring on your finger, you started dreaming. Dreams about; what dress will I wear; where will we get married; who will be my bridesmaids; who will we have surrounding us, and on and on the dreaming goes. Eventually you get to the question of who will we have as a photographer? And after a thorough search you decide upon David and Sherry Photography, curators of fine art memories. Our vision for photography doesn’t end in beautiful photographs captured in the perfect light, or reliving the emotion of the moment, or seeing the most amazing Couplescape. Only a high quality printed image will become a treasured heirloom and that is where it ends. We have curated for you the finest quality products. We have inspected, touched, smelled, yes smelled; because leather just smells luxurious; and offer to you what we think are the world’s best hand crafted wedding albums, giclee printed canvases, and the most beautifully framed prints. Our Albums are your wedding story, it starts even before your wedding day with a simple question we ask during our consultations. “5 years from now when you are looking at your wedding album, what do you hope to see?” How you answer this question along with the answers to our questionnaires and getting to know you as a couple shape what we are photographing for during your wedding. Knowing what is important to you becomes how we are able to custom design an album that best tells the story of your wedding day. 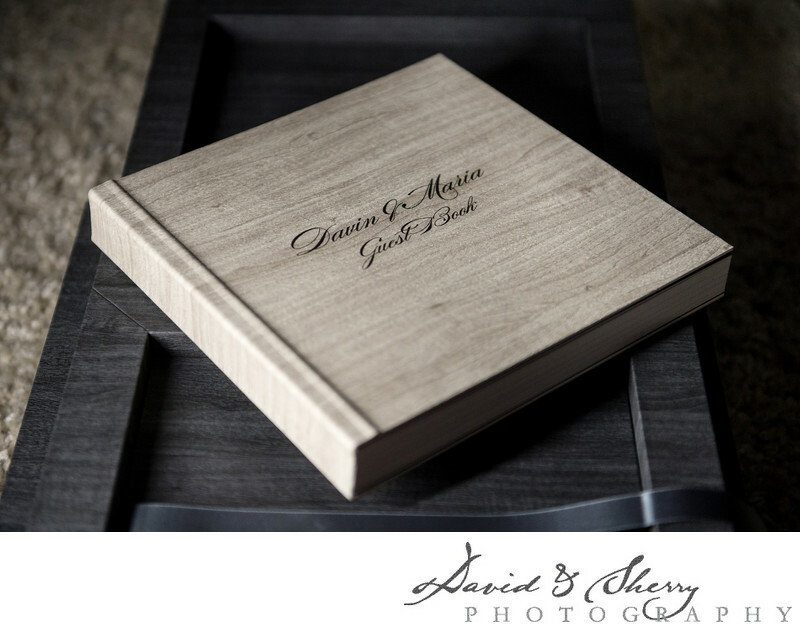 From your photographs we hand select the moments, the details, the portraits, and the couplescapes and create a one of a kind custom album design just for you. We ask only that you tell us which family photos you would like to have in the album - this is because we photograph your wedding day as a story and designing your story album is our pride and joy. After the design is complete we invite you to relive and reminisce your wedding day in our online viewing gallery. After you have shared a few laughs, shed a few tears, and relived the best moments of your wedding day, you need to decide what will protect and show off your memories for years to come. 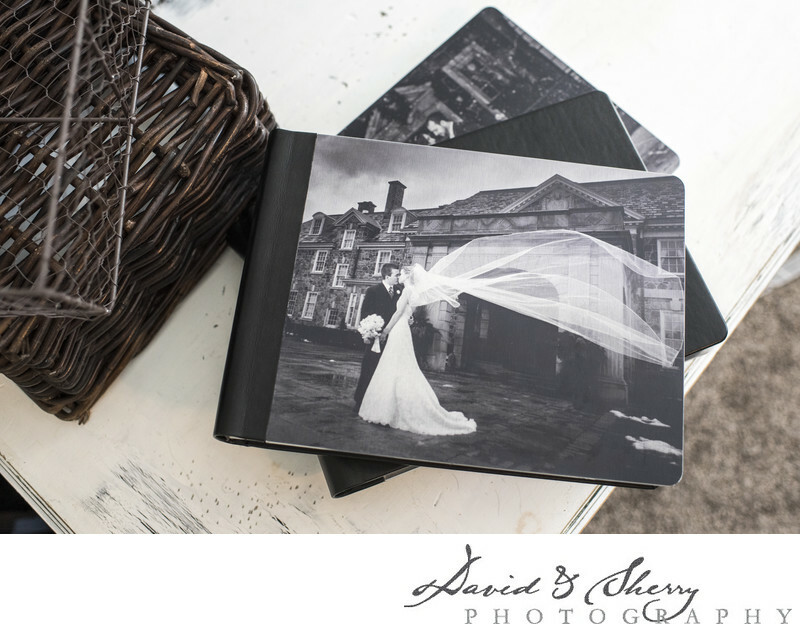 We offer many different album styles, colours, textures, boxes and looks to suit your wedding or photo shoot. You can see a gallery of options here. You can choose then to have your name and/or wedding date debossed on the front. Each of the elevated looks come with a chic and stylish sleeve that will keep your memories looking amazing for years to come. One of my favourite moments as a wedding photographer is sitting across from a couple as they are cuddled on a couch about to open their wedding album for the first time. As they slide their gorgeous album out of it’s sleeve and into their laps and stare at the cover for the first time, run their fingers over the rich leathers or cool metal, lifting the cover and turning to the first page…with either tears in their eyes or giggles of glee they take in the first page of their wedding story about to relive the day through a luxuriously printed, beautifully bound heirloom album. This is why I love wedding photography and am so honoured to be the acquisitioner and creator of fine art memories for so many wonderful couples. To hear about album sales sign up for our newsletter.